Powervamp is the designer, and manufacturer, of the ‘Portapump’ – a powerful DC operated portable fuel transfer system housed within a stainless steel tubular space frame. The Portapump is a rugged, all-weather pump designed for the rapid fuelling or de-fuelling of all types of aircraft or vehicles using jet A1 or diesel with a flash point above 37oC. Its compact 49cm x 36cm x 33cm dimensions mean it can be transported by aircraft, helicopter or automotive vehicle and due to its relatively light 27kg weight, it can easily be carried by a single person. Now in its 3rd generation, the Portapump has been continuously modified over its 22 years of production with improvements including a revised filter assembly, miniaturised control panel and weight reduction program incorporating its current open frame design. The customer base for portable GPU for aircrafts has grown rapidly over the last few years with a noticeable increase in sales attributed to its reputation for constant use in some of the most hostile environments. Whether being used for humanitarian work in the punishing heat of Africa or to assist extreme ski breaks within the holiday sector in Greenland, the Portapump has been designed to cope with the harshest conditions. One of its key features is the ability to operate from any 24V DC to 28V DC power source. This makes it ideal for running from a Powervamp 24V DC aviation GPU, automotive jump start pack or even a pair of truck batteries connected in series. The Portapump is supplied with 2 x 3m individual suction and delivery hoses as well as a 2-piece aluminium standpipe to allow the refuelling from 45 gallon fuel drums. Jet A1fuel is hygroscopic, (can absorb moisture from the air), which can cause contamination to fuel if left for extended periods of time. The Portapump will filter contaminated fuel to 5 microns solids, and 2 parts per million water. This means fuel drums or containers with contaminated fuel, or fuel that would normally require a settling period after transportation to allow fuel/water to separate, can be pumped immediately saving time and money. Even fuel drained from aircraft, vehicles or commercial plant machinery that would otherwise be discarded can safely be re-used once passed though the Portapump. The excess water is drained away via an external tap. At the heart of the Portapump is a powerful 24V DC – 28V DC motor direct coupled to a high-speed pump with phosphor bronze sliding vanes. The pump is fitted with a thermal shutdown feature to protect against over heating, and is fully serviceable ensuring many years of use. One customer that appreciates the reliability and fast filtered fuel delivery of the Portapump is Kenya based Everett Aviation who were able to complete a monthly transfer operation of crew members from a moving survey vessel more than 100 miles off the East African coast. Refuelling from multiple 45 gallon drums of Jet A1, each fuel uplift of 450 litres was completed in 5 minutes. A total of 9 round trips were made over an amazing 11 hour period during which the helicopter’s turbines were never shut down. 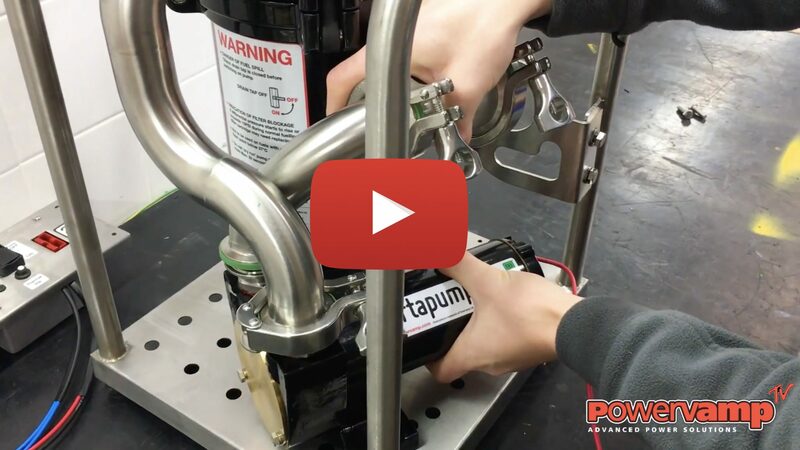 As the latest batch of Portapumps are being assembled to be sent out to the most remote locations, Electromechanical Technician ,Dave Catling, from the DC Assembly Team took time out to document the build process for the latest video to be uploaded to the Powervamp TV channel. or call our UK head office on +44 (0) 1934 643000.